I am frequently asked, "What is the difference between silver, silver-plate and Old Sheffield Plate?" Items made in silver are often referred to as sterling silver, solid silver, real silver and .925 silver. All these terms refer to items that are produced from sterling standard silver, which is 92.5% pure silver, or 925 parts per thousand pure silver. 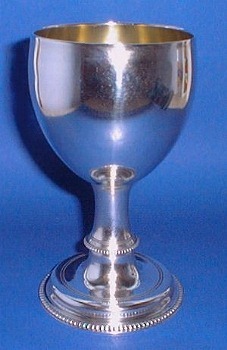 There are different standards of silver used throughout the world; for example France uses two grades, one of a lower quality .900 and a higher standard .950 which is superior to sterling standard. There is also the .800 standard that has been used by many countries in Europe, it has been illegal here in Britain to refer to the .800 standard as silver until the European Union laws were changed and harmonised in 1999. Silver-Plated or Electroplated items are made out of metal, usually nickel or copper, which are then electrically silver plated by using electricity, a potassium cyanide solution and two electrodes. The item to be silver-plated is placed in a tank of solution; one electrode is attached to the item while the other is connected to a piece of pure silver in another tank of solution. A low voltage current is passed through the solution and the item becomes plated with silver through electrolysis. The longer the item is left in the solution the thicker the layer of silver becomes. Today the thickness of plating is measured in microns. Earlier plating was often marked as 'A1' or 'Hotel Plate', which indicated a thicker layer of silver. Silver-Plate is frequently referred to as Sheffield Plate as thousands of silver-plated items have 'Sheffield' stamped on their bases. This only refers to 'the city' of Sheffield where items were manufactured, not the method of manufacturing. Many silver plated items bear the marks 'EPNS' that stand for Electro Plated Nickel Silver or 'EP' for Electro Plate. Old Sheffield Plate should be called Sheffield Plate, but nowadays this is greatly confused with Silver-Plate. Old Sheffield Plate came about in the middle of the 18th century as a cheaper alternative to silver. The production of Old Sheffield Plate involves taking a thick sheet of copper and a thin sheet of silver, rolling the two together through heavy-duty rollers and repeating this until the two fuse together. The silver on the copper sheet is left wafer thin, this large, thin sheet of Old Sheffield Plate is then ready to be used by the silversmith. Depending on the item to be made, for example a dinner plate or a wine goblet an additional sheet of silver would be rolled onto the underside of the copper, so the item is fully plated once made. If a copper edge of an item were visible, the silversmith would solder a thin silver strip to hide the edge. 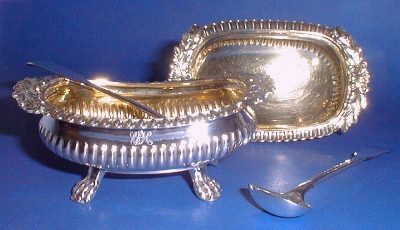 A lot of wear and tear or cleaning of an item will inevitably reveal the nickel or copper base on Silver-Plate or Old Sheffield Plate items. This is more noticeable if the base metal is copper due to the contrast in colour, and is known as 'bleeding'. Many people assume that a copper base is indicative of Old Sheffield Plate, remember that this in not usually the case. The easiest way to determine what is what is by the date of manufacture; Old Sheffield Plate stopped production around the 1840's, which is when electroplating began.